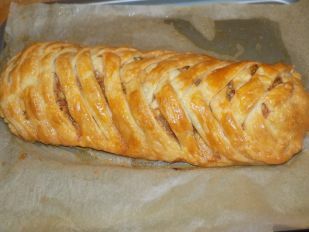 Italian Style Beef Plait – Create, Make & Bake! This basically tastes like Italy, and by that I mean it’s what you would imagine Italy tastes like. And if you still don’t understand then don’t worry, I don’t know either. But anyway, everyone liked it, even my hard-to-please little sister. There were a couple things improve on, but the pastry wasn’t one of them, for my first time properly doing puff pastry it was really good, and that’s even coming from me. I recommend getting a decent pack of mince for this, it really shows in the finished product, as we found the hard way. Looks hard to do, but it really isn’t that bad, *cough cough* Ignoring my several mini break downs *cough cough*. 1. For the pastry, mix the flour and butter with your fingertips, unlike normal pastry, don’t mix it all the way, there needs to be small chunks of butter visible. Then mix in the salt and water to form a slightly sticky dough. 2. On a (pretty heavily) floured surface, turn out the dough and knead for a minute, until its not sticky anymore. Roll it out to about 1cm thick, fold the top half of the pastry down to the middle and then the bottom over that. Roll it out again, and do the same, this is important for Puff pastry. Roll it out a third time to a wide rectangle, trim the edges so that they’re straight. Pre heat oven to gas mark 4/ 180*C/350*F. Line a baking tray with grease proof paper. Transfer the pasty onto the tray. 3. Put the mince in a bowl and mash it up a bit with your hand (if you’re too squeamish to do this then you can use a spoon, but it’s better if you use your hands). Mix in the rest of the ingredients except the egg and tomato ( it’s easier if these are added later). 4. Still with your hands, mix in the egg and tomato, or are you too squeamish :)?? Anyway, after that, put the filling down the middle of the pastry, forming a long brick. The filling should take up about a third of the width of the pasty, also leaving room at the top and bottom, about 3 inches. 5. This part is hard to explain, so listen closely. With a knife, cut the sides into strips at about a 45* angle, each strip should be about an inch wide, do this down both sides, (note: I found its easier if you cut about 1cm from the filling itself). Fold the top over the filling, and cut away those corners, do the same to the bottom. 4. Start plating it by folding the first strip ( on the left or right side, it doesn’t matter) over the filling, fold the same strip on the opposite side over that one, alternate (left, right. Right, left. Left, right. Right, left. Get it? Good.). Carry on until the end. Brush the plait with egg. 5. Bake for 30 minutes, then turn it around and bake for another 30 minutes. Done! (I was honestly quite proud of mine, it was like a baby, I didn’t want to eat it. ).